NW 23rd avenue, also known as Nob Hill, is a perfect neighborhood to explore on foot with lots of one-of-a-kind boutiques, national retailers, and delicious eateries. Best of all, two blocks away on NW 21st avenue, there are more opportunities for strolling, shopping, and eating. 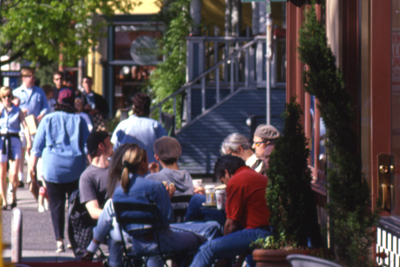 Restaurants range from Bamboo Sushi and Papa Haydn to Escape from New York Pizza and McMenamins Blue Moon Tavern & Grill. Unique shops include Sloan Boutique, Ellington Handbags, and Betsy & Iya jewelry. National chains are represented by Urban Outfitters, Pottery Barn, Lush Cosmetics, and Goorin Bros. hats. Catch a movie at Cinema 21 — and don't forget to sample a deliciously uncommon ice cream flavor at Salt & Straw. Tri-Met 35 Greeley (from N Portsmouth St. & N Willamette Blvd.) to SW 5th Ave. & Alder St; Walk to SW 5th Ave. and SW Washington St. and transfer to Tri-Met 15 Belmont/NW 23rd; Get off at W Burnside St. and NW 23rd Ave. Trip time: 60 minutes.